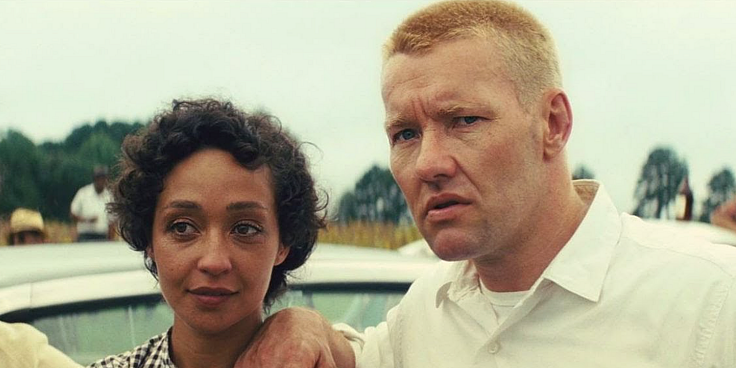 THE STORY - In 1967, Richard (Joel Edgerton) and Mildred (Ruth Negga) Loving take their case to the Supreme Court after violating a Virginia law that prohibits interracial marriage. THE GOOD - Great performances from Joel Edgerton and Ruth Negga. Solid work from the production team. ​Jeff Nichols has carved a fine career out for himself in telling the story of everyday people caught up in dramatic circumstances. Despite these circumstances, he never loses sight that his stories are not necessarily about the big and dramatic moments, but the quieter and more humanistic moments. This is especially true in his fifth feature “Loving.” It’s the film’s biggest strength and also its biggest weakness. Many will hail “Loving” as an earnest and powerful story of how two people’s love changed the nation. Others will watch with interest, waiting for something big and dramatic to happen, yet that moment never comes. The result will leave audiences divided, but make no mistake “Loving” is a fine film and another great example of the talent that is Jeff Nichols. It's 1967 in Virgina and a white man named Richard (Joel Edgerton) has asked an African American named Mildred (Ruth Negga) to marry him. She says yes and the couple take a drive to Washington D.C. to get married as the state of Virginia prohibits it. Upon their return back to Virginia, they plan to raise their family nearby Mildred and Richard's own and in a house which Richard intends to build for his new wife. However, they are eventually arrested for their crime of interracial marriage by a racist cop (Marton Csokas). They are contacted by a lawyer named Bernie Cohen (Nick Kroll) who believes their case can go to the Supreme Court and alter the constitution of the United States. The performances in "Loving" between the two leads is where the power of this story lies. Ruth Negga, who stars in AMC's "Preacher" sheds her natural Scottish accent and takes on a southern accent with skill and grace as she emotionally draws the viewer in. Joel Edgerton has never been this reserved before as he does not speak much but is able to convey a warm tenderness at the center of his performance. Both performers help to elevate the story to the level of acclaim the film has been achieving since it debuted at the Cannes Film Festival earlier this year. Supporting performances include Nick Kroll who does away with his comedic side (Although there are one or two moments where it shines through) and Michael Shannon (Who has shown up in all of Jeff Nichol's films) who appears in one brief scene as a Life Magazine photographer. Both are serviceable but are not given enough material to necessarily stand out. Marton Csokas has one devilish monologue and is a strong presence early in the film but quickly disappears in the second act, never to return. This is Edgerton and Negga's movie and they carry it very well. Jeff Nichols brings back his usual crew on his fifth feature. Cinematographer Adam Stone, editor Julie Monroe, and production designer Chad Keith all do good work but it is once again composer David Wingo who stands out. After scoring one of my favorite soundtracks of the year in "Midnight Special," here he employs a more traditional dramatic score that gives "Loving" its heart and soul with beautiful and quiet moments. The biggest issue with "Loving" is how reserved the filmmaking is. How reserved the performances are. How reserved the entire crafts team are. Everyone is doing solid work to aid in the telling of what is already a powerful story but "Loving" is missing that one extra moment to allow it to hit us directly in the feels. This did not need to be a heart-wrenching moment, although there is something to be said that when the case is finally resolved and Mildred and Richard receive the decision from the Supreme Court and the moment is met with coldness from me, then there is a problem. I will not say that this is a problem that is universal. I believe the problem I have with this film is a personal one that others may not share. I still think that Nichols shows incredible abilities as a storyteller and as a filmmaker, however, "Loving" was not able to emotionally connect with me in the way that I had hoped it would. I have no doubt that it will for countless others and if the film does not do it for you, there's always the 2011 documentary "The Loving Story." In it, you can see how reserved and private the Loving family was and Nichols beautifully captures that. He does not betray the story, nor the characters and for that, he deserves to be commended. As a result (Although it may not have affected me emotionally), "Loving" serves as a strong reminder of our right to love and how far we still have to go as a nation in accepting that.